OPERA ON THE LAKE 2015 TURANDOT GIACOMO PUCCINI 22 JULY – 23 AUGUST 2015 ”Nessun dorma” – no one may sleep, because by daybreak the Chinese princess has to find out the name of the unknown prince. Calaf was the first suitor to solve her riddles, but what he wants is Turandot’s love... Lyric drama in three acts and five scenes (1926) | Libretto by Giuseppe Adami and Renato Simoni after the play by Carlo Gozzi | Sung in Italian with German surtitles PREMIERE 22 July 2015 – 9.15 p.m. One of the most famous of all arias was composed by Giacomo Puccini for his last opera. The Chinese princess Turandot has commanded that no one is to sleep – ”Nessun dorma” – for the night because by daybreak she has to find out the name of an unknown prince – or else return his love. So far she has kept men away by means of a brutal oath: any man that wants to conquer Turandot must first solve three riddles; and if he fails he is beheaded. Like so many men before him, the unknown prince is spellbound by her appearance. He’s the first suitor to solve all three riddles. But he wants her heart, so he sets a riddle of his own. If she discovers his name by morning, he’s ready to go to his death. Another woman, Liù, knows his name but movingly prefers to take her own life than reveal her secret – she loved the prince too much. PERFORMANCES 24, 25, 26, 28, 29, 31 July – 9.15 p.m. 1, 2, 4, 5, 7, 8, 9, 11, 12, 13, 14, 15, 16, 18, 21, 22, 23 August – 9.00 p.m. Seebühne | Festspielhaus Conductor Paolo Carignani Stage director & stage designer Marco Arturo Marelli Costume designer Constance Hoffman Vienna Symphony Orchestra Prague Philharmonic Choir Bregenz Festival Chorus Publisher: Universal Edition AG, Vienna on behalf of Casa Ricordi, Milano FESTIVAL LOUNGE PREMIUM TICKET © Atelier Pi © Anja Köhler The Festival Lounge offers you and your guests every opportunity for an exclusive evening at the Bregenz Festival. Our hostesses welcome you with an aperitif and then take you on a backstage tour during which you can find out all about the Bregenz Festival. After this comes the culinary highlight of the evening, the festival dinner. Then you will be conducted to your upholstered seat in the covered viewing area of the Festival Lounge. After the show you can relax and reflect on the evening over a farewell drink. 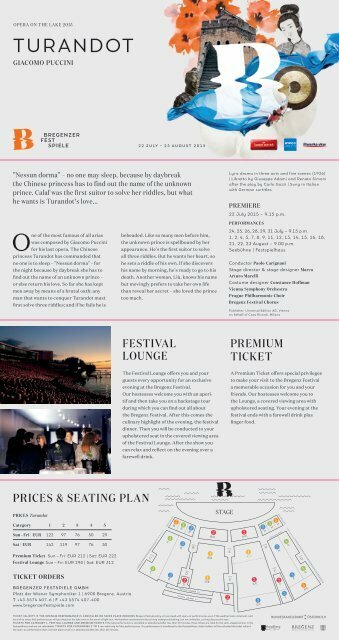 A Premium Ticket offers special privileges to make your visit to the Bregenz Festival a memorable occasion for you and your friends. Our hostesses welcome you to the Lounge, a covered viewing area with upholstered seating. Your evening at the festival ends with a farewell drink plus finger food. PRICES & SEATING PLAN PRICES Turandot Category 1 2 3 4 5 Sun – Fri | EUR 122 97 76 50 29 Sat | EUR 142 119 97 76 50 Premium Ticket Sun – Fri: EUR 212 | Sat: EUR 222 Festival Lounge Sun – Fri: EUR 298 | Sat: EUR 312 TICKET ORDERS BREGENZER FESTSPIELE GMBH Platz der Wiener Symphoniker 1 | 6900 Bregenz, Austria T +43 5574 407-6 | F +43 5574 407-400 www.bregenzerfestspiele.com TICKET VALIDITY IF THE OPENAIR PERFORMANCE IS CANCELLED OR TAKES PLACE INDOORS Bregenz Festival policy is to proceed with open-air performances even if the weather looks inclement, and we wish to stress that performances will go ahead on the lake even in the event of light rain. We therefore recommend visitors bring waterproof clothing, but not umbrellas, as they obscure the view. TICKETS FOR CATEGORY 1, FESTIVAL LOUNGE AND PREMIUMTICKETS If the lake performance is cancelled or abandoned after less than 90 minutes, these tickets are valid for the semi-staged version in the Festspielhaus and are not refundable. TICKETS FOR CATEGORIES 2 TO 5 are valid only for lake performances. If a performance is transferred to the Festspielhaus, ticket holders will be refunded the ticket value if the open-air performance does not take place at all or is abandoned after less than 60 minutes.